The European Individual Women Chess Championship final round is underway in Belgrade, Serbia. The information in this article has been of Chessdom’s knowledge for several days, but was not published so far in order not to disturb the concentration and playing rhythm of the EIWCC participants. Before the start of the EIWCC the ECU President Silvio Danailov decided to single-handedly enter IM Ekaterina Atalik in the championship under the ECU flag. IM Atalik is federated in Turkey and had no obstacles to play under the Turkish flag. However, Mr. Danailov, without consulting the board and without following the FIDE established procedures in such case, has decided she will play under the ECU flag. 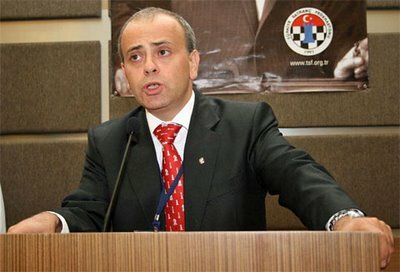 The FIDE Vice President Ali Nihat Yazici has sent an official protest to the FIDE Presidential board, describing the series of illegal decisions by Silvio Danailov. In the official protest are demanded cancelation of results by IM Atalik, followed by corrections in the standings, maintaining the raiting changes, but changing the prize fund distribution. As addition, Silvio Danailov should pay a fine and pass through the FIDE Ethical Commission for overstepping his rights. Here is the official protest sent by the FIDE Vice President, expect more updates and details on the story in the next days. With the illegitimate personal decision of the ECU President, IM Ekaterina Atalık (who is still under Turkish flag in ELO List) has taken part in European Individual Women Championship, organised in Belgrade, under the ECU flag. The only authority to make a decision on this matter is FIDE. I. IM Ekaterina has applied to ECU with a letter on 22 April 2013 (Appendix 1). 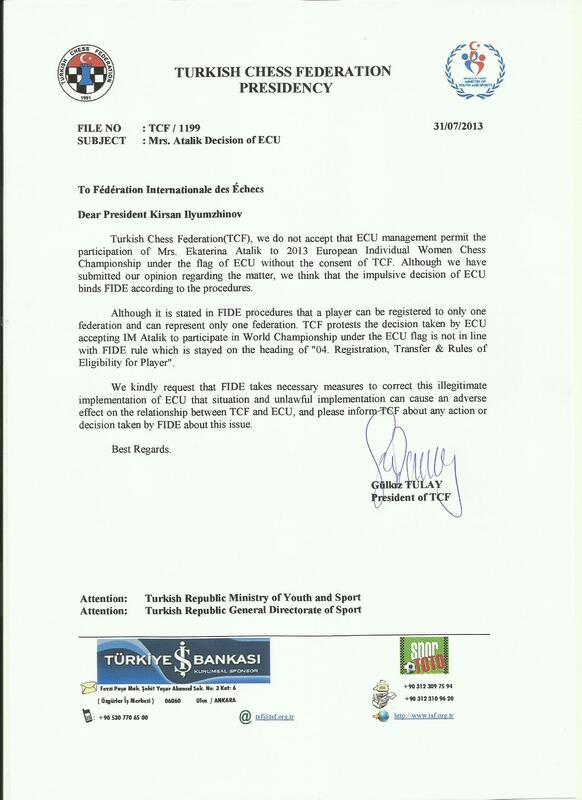 With delusive claims she asked ECU to play under the ECU flag, instead of the Turkish flag in following European Individual Women Championship. II. ECU asked TSF respecting the decision of the ECU Board, about the opinion of Turkish Chess Federation (15 May 2013 – Appendix 2). IV. 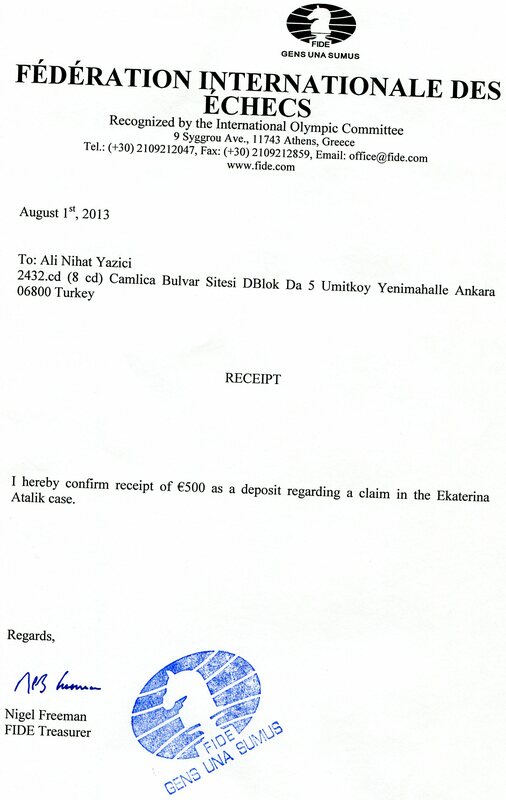 After such ill-mannered responses, TSF replied to ECU that they do not accept IM Atalik to play under the ECU flag. TSF has used exactly the following sentence: ‘consequently TCF management cannot accept her participation in any competition under any other flag.’ As TSF mentioned there, for them it was not an issue for the player to play under the Turkish flag. VI. 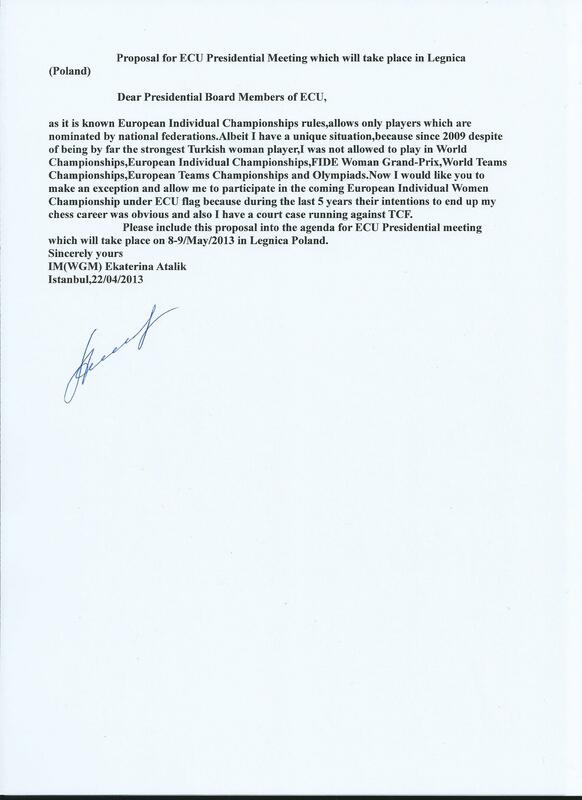 After this communication, the president of ECU who is member in FIDE Presidential Board, made a personal and illegitimate decision to give permission to IM Atalık to play in the European Individual Women Championship (Appendix 8). I would like to remind PB Members that Mr.Danailov does have neither any education in law science, nor he is competent with the FIDE rules, to make such a decision. He did not get the opinion of his board either. VII. On 20 July 2013, before tournament started, TSF President sent a protest to ECU; I will kindly ask all of you to read this letter with attention (Appendix 9). She has underlined the following facts on her protests against the ECU decision. TCF nor applied to TCF about this matter. d. TSF does not accept Atalik plays under ECU flag. e. TCF WOULD BE HAPPY, TO HAVE IM ATALIK REPRESENT TURKEY! Then President of TCF is asking following questions to Danailov. Mrs. Tulay is asking why ECU asked the opinion of TCF, if they would disregard it. She asked also how ECU may make such a decision instead of FIDE. (I should correct her that the decision is not made by ECU; it was taken by the President of ECU). VIII. After Atalik played some rounds, TCF has sent a protest to FIDE on that matter. (Appendix 10) TCF has also mentioned the violation of FIDE rule (B.04) on that matter. IX. IM Atalik has breached the rule B.04. ; by playing under the ECU flag in the 2013 European Individual Women Championship. 1) Since IM Atalik breached the article 1 of B.04., she has to be penalized as it was mentioned in the same rule. 2) By respecting the article B.04.8.2.a. ; the results of IM Atalik in 2013 European Individual Women Championship should be annulled and all opponents played with her should be given full score as below. 3) All results of IM Atalik must be kept for rating and title matters as it was concluded in actual tournament. All qualification rights of IM Atalik, for any event over the 2013 European Individual Women Championships should be cancelled. Actual score of IM Atalik should be registered as Zero – Null- historically. 4) The prizes and qualification rights earned from the European Individual Chess Championship 2013 should be corrected respecting the scores given above. 5) ECU President should pay 5.000 € respecting to B.04.8.4 since he made the illegitimate decision. 6) FIDE PB should send both IM Atalik and ECU President Danailov to FIDE Ethical Commission. 7) 500 € protest fee should be reimbursed to complainant.